Black’s Distillery in Kinsale Co.Cork has today announced the launch of their Blacks Spiced Irish Rum. 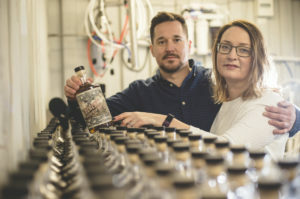 They have been working on the product for several years and are delighted to be Irelands first and only (for now) Irish Rum. This is Ireland’s first ever Irish Rum which is made from the start in Ireland, other rum are imported and repacked here, but Blacks is made from the finest Sugar Cane Molasses which is fermented, distilled and matured in oak barrels in Kinsale, Co.Cork. Blacks also make an Irish Gin and a range of popular beers since 2013. Rum is a much harder spirit to master, years of research, experimentation and then aging in oak barrels has lead to a world class product everyone can be proud of. Commenting on the announcement, Blacks founder Sam Black said “We are delighted to be launching the Ireland first ever home distilled rum after several years of hardwork since getting the distillery started in 2015. We hope Irish Rum will become a new trend and help boost the international profile of the brand. Blacks continue to brew beer and to distil the their popular Irish Gin and have plans for a Vodka and Whiskey next.